Do you believe we are meant to meet people for a reason?? So far, many people have come and gone in my life, but there have been some that I can vouch came for a very solid reason. Today I share about how I met one. 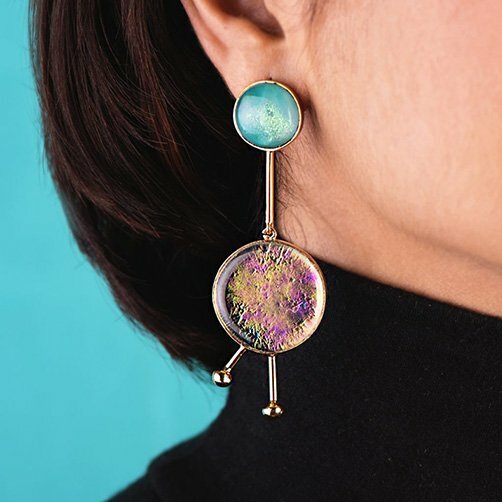 Ikroop Dhillon, owner and curator of the Glass Art Jewellery brand Ikroop, was on my Instagram feed one day. The article read – how travels to Murano in Italy was a “life changing” event. This captured my attention and I opened it to find an interview where Ikroop was talking about her glassware business for the Verve magazine. I was immediately enticed and soon contacted her! Ikroop warmly asked to meet up for a cup of coffee and we chatted about her glass art jewellery and my love for all things Italian. Her story was dreamy as most of her business inspiration comes from the island of Murano-renowed globally for its glassware. Ikroop: I picked this for myself. The best part is that her inspiration got the better of her when she decided to turn her love for glassware to a business! Most of her collection is inspired from her Murano travel where she saw beautiful art created from blown glass. She started the brand “Ikroop” after working with the famous glass artist Atul Bakshi. Once she gained knowledge of the process, she realized her forte and started making minimalist glass art jewellery. Her collection is versatile and classy, making it every woman’s dream! There are various colours fused together to create every type of pendants, rings, earrings and neck pieces. I felt that there is something for everyone on her website and I myself picked up a beautiful pendant that can be worn for both any kind of event whether a party or a business meeting. Owning a glass jewellery isn’t common in India (as opposed to Italy).However, I hope that with brands such as Ikroop it becomes part of every woman’s wardrobe. I would have never have imagined I’d meet a fellow Italophilie living only 7 kms from my house and inspired from travels to Italy as much I am! Thank You Italy for another fabulous connection! Follow Ikroop’s stunning collection on her Instagram or Facebook page. Also check these great books on Italy and Venice. Meanwhile, subscribe to my Newsletter. What lovely pieces. I love Murano glass and own a couple of pendants (gifts from hubby). How wonderful that you met! I love the piece you picked for yourself. I do too, some earrings 🙂 I actually fanciesd them even more after checking Ikroop’s pieces. Thank you! Wow beautiful jewelry! I love love Murano glass! I still have a pendent that I bought when I was 12! Its amazing how we connect with people on Social Media. It indeed is. Never thought the world would get so small as much as 7 kms from home 😉 thanks for your comment cara! Very nice, Ishita. And yes, it’s a small world. You never know who’s right around the corner. I recently joined a “meet up” group here in Las Vegas called “Parliamo Italiano,” and while everyone doesn’t speak Italian, it’s amazing how many actually do and they’re all Italophiles! How cool Karen! I think every other week I am meeting a fellow Italophilie 🙂 It really is a small world. And thank you! Karen, did you receive my comment on your blog?? I commented on your latest post but could not see it. Thank you for letting me know. It should have been posted right away as only messages of non-subscribers are held back for moderation, but somehow it made its way into the trash folder, but I found and restored it! Thanks for your support. I believe the same ! We are meant to meet people for a reason !